Mafalda Baptista is a postdoc researcher at CIIMAR (Interdisciplinary Centre of Marine and Environmental Research, University of Porto) working on microbial ecology of aquatic systems and extreme environments. She got her PhD in Environmental Sciences and Technology from the University of Porto. Since then she has established a number of collaborations with research institutions, namely the Center for Environmental Implications of Nanotechnologies, University of California at Santa Barbara, in the USA, the Department of Ecology, Environment and Plant Sciences, University of Stockholm, in Sweden, and the International Centre for Terrestrial Antarctic Research, University of Waikato, New Zealand. Mafalda’s work has encompassed diverse marine organisms from phytoplankton to invertebrates, tackling their individual and cumulative roles in the ecosystem, in order to obtain a holistic view. 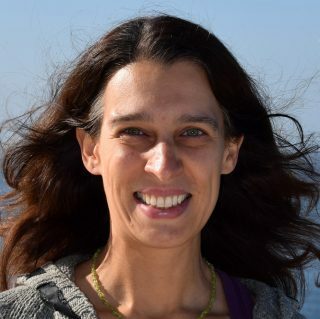 From assessing the species diversity to the metabolites they produce, from assessing cascading effects of those metabolites in the surrounding organisms to their multitrophic-level impact, her previous work has show the intricate relationships that increase the complexity of possible outcomes and make predictions of the overall effects more difficult in critical ecological processes. As part of the cruise Mafalda will be a member of the Biological/Biogeochemistry team, and will collect water samples for genomics/metagenomics and biogeochemical analysis to study the biological/biogeochemical gradients across ocean fronts.